Possessing a voice praised by the San Francisco Chronicle for its “effortless precision and tonal luster,” Grammy Award-winning soprano Jessica Rivera is one of the most creatively inspired vocal artists before the public today. The intelligence, dimension and spirituality with which she infuses her performances on great international concert and opera stages has garnered Ms. Rivera unique artistic collaborations with many of today’s most celebrated composers, including John Adams, Osvaldo Golijov, Gabriela Lena Frank, Jonathan Leshnoff, Nico Muhly, and Paola Prestini, and has brought her together with such esteemed conductors as Sir Simon Rattle, Esa-Pekka Salonen, Robert Spano, Markus Stenz, Bernard Haitink and Michael Tilson Thomas. During the 2018-19 season, Ms. Rivera makes debuts at the Aspen Music Festival in Gabriela Lena Frank’s La Centinela y la Paloma with the Aspen Philharmonic Orchestra led by Federico Cortese, and at the Grand Teton Music Festival performing Barber’s Knoxville: Summer of 1915 . Orchestral engagements include performances of Mozart’s Requiem with the Louisville Orchestra conducted by Teddy Abrams, Handel’s Messiah with the Nashville Symphony and Giancarlo Guerrero, Four Last Songs by Richard Strauss with the Fort Worth Symphony and Robert Spano, and Beethoven’s Ninth Symphony with the Atlanta Symphony Orchestra conducted by Thomas Søndergård. A major voice in the rich culture of Latin American music and composers, Ms. Rivera performs in Antonio Lysy’s beloved Te Amo Argentina with Arizona Friends of Chamber Music. Ms. Rivera also performs the world premiere of a new work by acclaimed composer Nico Muhly with the National Children’s Chorus and the American Youth Symphony conducted by Carlos Izcaray at Walt Disney Concert Hall in Los Angeles. In recital, the artist will partner with pianist Mark Carver for a program titled Homage to Victoria de los Angeles at The Society of the Four Arts in Palm Beach, Florida. Recent seasons have seen Ms. Rivera premiere Gabriela Lena Frank’s Conquest Requiem with the Houston Symphony and Chorus conducted by Andrés Orozco-Estrada, and perform John Harbison’s Requiem with the Nashville Symphony and Chorus under Giancarlo Guerrero, recorded for future release on the Naxos label. Ms. Rivera treasures her decade-long collaboration with Robert Spano and the Atlanta Symphony Orchestra, and was recently featured as soprano soloist in Brahms’s Ein deutsches Requiemand Jonathan Leshnoff’s Zohar with the ASO and Chorus at Carnegie Hall; additionally, she joined Spano for Christopher Theofanidis’ Creation/Creator in Atlanta and at the Kennedy Center’s 2017 SHIFT Festival of American Orchestras, where she also sang Robert Spano’s Hölderlin Lieder, a song cycle written specifically for her and recorded on the ASO Media label. Recent orchestral highlights include Mahler’s Fourth Symphony with Colombia’s Orquestra Filarmónica de Bogotá led by Juan Felipe Molano, the Mozart Requiem with the San Diego Symphony under the baton of Markus Stenz and with Roberto Abbado leading the Atlanta Symphony Orchestra, the lush Brahms Requiem with the Kansas City Symphony, the Mozart orchestration of Handel’s Messiah with Ottawa’s National Arts Centre Orchestra with Alexander Shelley, Esa-Pekka Salonen’s Five Images After Sappho and Poulenc’s Gloria with the Colorado Symphony, Beethoven’s Ninth Symphony with the Grand Rapids Symphony, Barber’s Knoxville: Summer of 1915 with Karina Canellakis and the Detroit Symphony Orchestra, Strauss’s Orchesterlieder with Johannes Stert and the Orquestra Sinfónica Portuguesa in Lisbon, and Górecki’s Symphony No. 3 with Gustavo Dudamel and the Los Angeles Philharmonic among many others. Additionally, she joined in the celebrations of Leonard Bernstein’s centennial at the Celebrity Series of Boston’s What Makes It Great with Rob Kapilow and performed the role of Eileen in Bernstein’s Wonderful Town for her debut with the Seattle Symphony conducted by Ludovic Morlot. Ms. Rivera has worked closely with John Adams throughout her career, and received international praise for the world premiere of Adams’s opera A Flowering Tree, singing the role of Kumudha in a production directed by Peter Sellars at Vienna’s New Crowned Hope Festival. Subsequently, she has performed the role in her debut with the Berlin Philharmonic and Sir Simon Rattle, the Teatro Nacional de São Carlos in Lisbon and the Cincinnati Opera led by Joana Carneiro. Under Adams’s baton, she has sung Kumudha with the San Francisco Symphony, Los Angeles Philharmonic, Orchestra of St. Luke’s at Lincoln Center and the London Symphony Orchestra at the Barbican Centre. Ms. Rivera made her European operatic debut as Kitty Oppenheimer in Sellars’ acclaimed production of Adams’s Doctor Atomic with the Netherlands Opera, a role that also served for her debuts at the Lyric Opera of Chicago, Finnish National Opera and Teatro de la Maestranza in Seville, Spain. She joined the roster of the Metropolitan Opera for its new production of Doctor Atomic under the direction of Alan Gilbert. Ms. Rivera has also performed Nixon Tapes with the Pittsburgh Symphony under John Adams’s direction, as well as his composition El Niño with the Boston Symphony Orchestra and Saint Louis Symphony Orchestra under David Robertson, San Francisco Symphony under John Adams and at the Edinburgh International Festival with James Conlon and the BBC Scottish Symphony Orchestra. Ms. Rivera made her critically acclaimed Santa Fe Opera debut in the summer of 2005 as Nuria in the world premiere of the revised edition of Osvaldo Golijov's Ainadamar . She reprised the role for the 2007 Grammy Award-winning Deutsche Grammophon recording of the work with the Atlanta Symphony Orchestra under Robert Spano, and bowed in the Peter Sellars staging at Lincoln Center and Opera Boston, as well as in performances at the Barbican Centre, the Adelaide Festival of Arts, Cincinnati Opera, and the Ojai, Ravinia, and New Zealand International Arts Festivals. 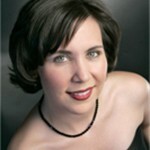 Performances of Margarita Xirgu in Ainadamar took place in the summer of 2007 at the Colorado Music Festival under the baton of Michael Christie and she reprised the part recently for the Teatro Real in Madrid. Committed to the art of recital, Ms. Rivera has appeared in concert halls in New York, Los Angeles, Chicago, San Francisco, Cincinnati, Oklahoma City, Las Vegas and Santa Fe. She was deeply honored to receive a commission from Carnegie Hall for the World Premiere of Nico Muhly’s song cycle entitled The Adulteress for her Weill Hall recital performance.